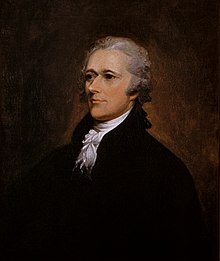 Alexander Hamilton (Januar 11, 1755 or 1757 – Julie 12, 1804) wis a Foonding Faither o the Unitit States, chief o staff tae General Washington, ane o the maist influential interpreters an promoters o the Constitution, the foonder o the naition's financial seestem, an the foonder o the first American poleetical pairty. ↑ Lind 1994, pp. 41–2. "The anly non-native amang the Foondin Fathers . . . As an immigrant, Hamilton lacked ony ties tae a particular region that micht hae qualified his intense devotion tae the American naition in its entirety". This page wis last eeditit on 7 Mairch 2018, at 08:01.